In the code above, in the second line from the bottom, replace pageURL with the page URL – e.g. 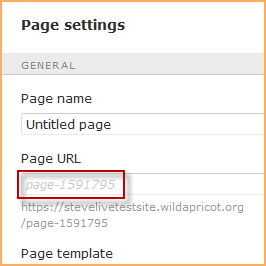 removeLinks("page-56457") – of the page. You can find the page URL within the page settings. In the code above, in the second line from the bottom, replace pageURLarray with an array of page URLs within quotation marks and separated by commas – e.g. removeLinks(["Scholarship-and-Grants", "Fundraisers", "Join", "Events"]) – of the pages. You can find the page URL within the page settings. If the code you have inserted doesn't work, check to make sure that the quotation marks appearing in the code are straight quotation marks – " " – rather than curved or curly (aka smart) quotation marks – “ ”. Some word processors including Microsoft Word and Google Docs automatically convert straight quotation marks to curly ones.